Sporting Lisbon midfielder William Carvalho is reportedly wanted by Manchester United and Real Madrid. 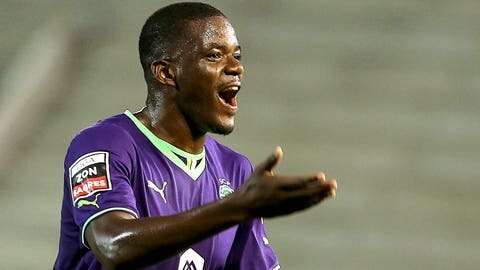 Sporting Lisbon president Bruno de Carvalho claims that William Carvalho is not looking for a move away from the club. The Angola-born midfielder recently said he was flattered with reports linking him to both Manchester United and Real Madrid, with Chelsea also rumoured to be monitoring his situation. Stories in the British media this week claimed that Carvalho’s agent had visited United’s training ground and that a deal to secure a move this summer was close to being agreed for the player, who has scored three goals in 23 appearances this season. Carvalho, 21, has a £37.5m ($62.34) buy-out clause built into his contract, which still has four years to run. "We are calm although every day there are stories in the papers appearing about the sale of our player," the Sporting chief told TVI 24 in Portugal. "Sporting is not a club exclusively just for the sale of players. If a club pays 45m euro then it is not necessary to speak, but I think William does not want to leave Sporting. "At the moment it is more likely that he will sign a new deal. Personally, I say that the kid is content at Sporting."